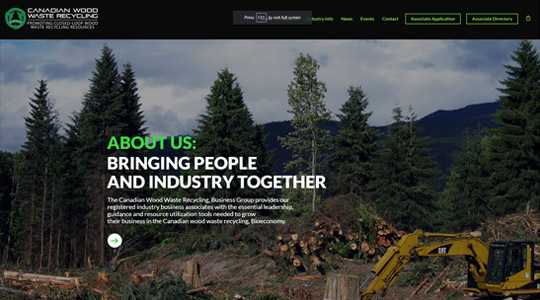 The CWWR Business Group is Canada’s leading Wood waste recycling and resource management business group focused on bringing industry businesses together on a national basis to develop the Canadian Wood waste recycling bio-economy. 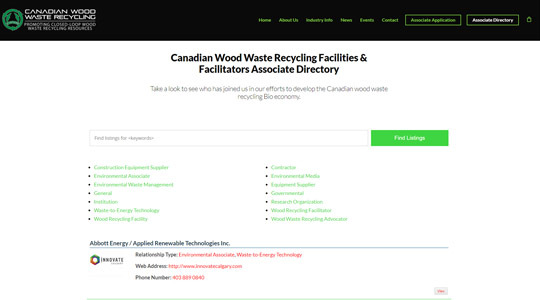 The Canadian Wood Waste Recycling, Business Group provides registered industry business associates with the essential leadership, guidance and resource management utilization tools needed to grow their respective business in the Canadian Wood waste recycling and waste-to-energy conversion markets. The CWWR Business Group required a ‘go green/eco’ feel with tie-ins to their respective partner websites and consistent brand enforcement without overcomplicating the viewer experience. The website development also required a user-friendly and secure business directory that could grow and evolve with the business. We constructed a robust WordPress website with sharp and vividly-coloured graphics and beautiful flow of information, and of course mobile responsiveness. The obvious emphasis would certainly be the colour green, and of course cleverly accented highlights and elements that give those green colours even more ‘POP!’. Insofar as graphic design is concerned, an environmental website design is always a pleasure to work with since so many of the nature-themed images and branding used works with many vivid and beautiful colours. All design aside though, the information is the important part, and getting visitors through important ideas and information about the CWWR Business Group itself, before guiding any potential conversions to the contact information. 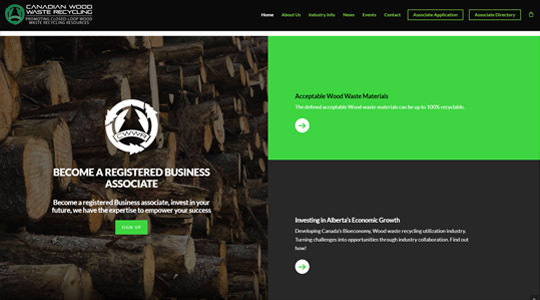 The focus of the business itself is to inform and empower businesses involved in- or interested in the process and potential profitability of wood waste recycling or waste-to-energy conversion practices. Our team needed to make sure that customers were always receiving the underlying message of the site while giving their audience the opportunity to lean more about every facet of wood waste closed loop energy conversion and recycling, and keeping elements of audio/visual entertainment interlaced throughout to maintain interest and break up the monotony that can often come from text-heavy informational websites. Keep the information flow enjoyable to the viewer and viewer will want to enjoy more information. Simple. Are you an environmental business or group interested in environmental website design and development, or maybe looking to add increased marketability or better information flow? Call any time for a free consultation and see what we can do to help get your message to the world. In todays technology marketplace, data is worth more than gold. Development and proper maintenance of an active business directory within a website can be more than just a good idea, it can be a game-changer, thrusting your website into the excellent position of being a go-to source of information. More people coming back to- and actively referring to- your website as a relevant source of accurate and updated contact information for any market. 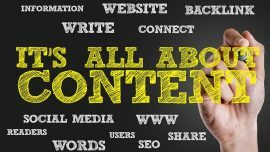 It gives people a reason to come back, and like with all fresh and original content, improves your organic SEO over time by providing additional keyword-rich original content to index. Interested in integrating a business directory into your existing website? We can help! Click here. While many websites lean on relatively bland, albeit clean and easy to navigate visual layout, clients like WRRC use the opportunity for graphic design to draw attention to the underlying message of their business and their brand; go green. emphasis on the colour green, and the natural and strikingly beautiful landscapes of Canada they are trying so hard to protect. If your interested in some professional design services for your next website design project, please contact us an time.